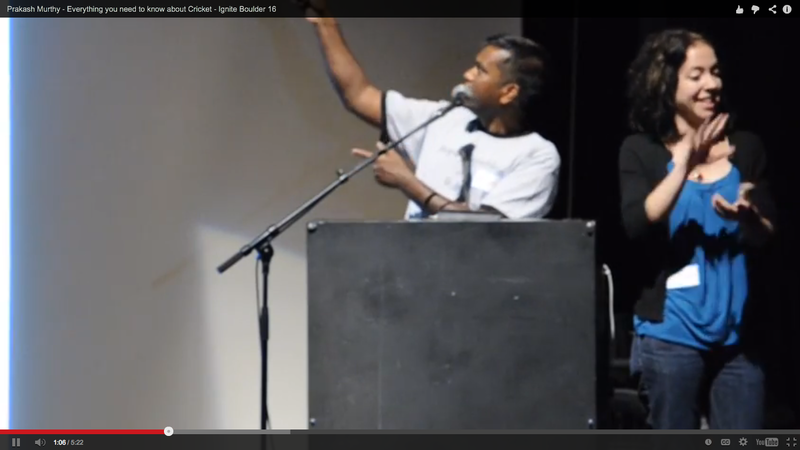 Not too long ago, I used to dread any situation that involved me being on stage and addressing a lot of people. One time during my engineering college days, I was asked to say a few words while accepting a prize I had won in some competition; I went up on the stage, blurted out "Thank You" and made my escape very quickly! I went through an entire 2 years MBA course avoiding speaking up in any group discussion exercises or making presentations. Safety First was the mantra which was driving such "risk-avoidance" behavior. :-) The one time everyone in the class had to make a presentation in front of the class, I hated it with all my heart. When it was my turn, I spoke at break-neck speed without pausing to take a breath. Many of my classmates were imploring me with gestures to slow down. While I was noticing what they were saying, I seemed to have no power to make any changes in my delivery style. Escaping from the spotlight was of the utmost importance, and I had to get away from there ASAP! 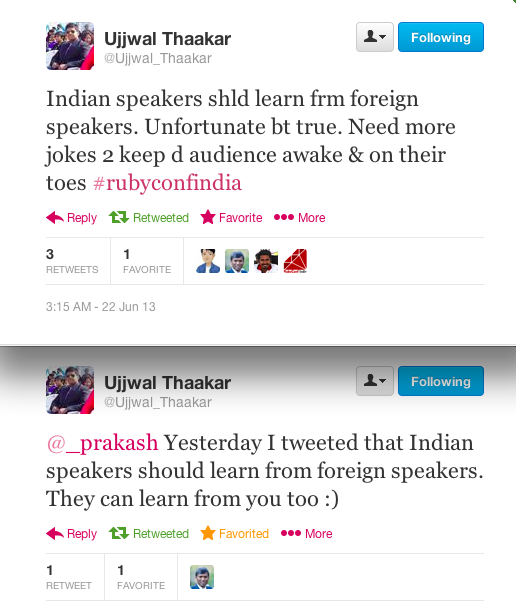 Here is one feedback I got after my talk at RubyConf India earlier this year. As the feedback testifies, I am no longer the same person I described at the beginning of this post. These days, I enjoy being on stage! I am very comfortable being up there and engaging a large audience in an entertaining manner. The "dread of the stage" which used to be part of my personality for long is no where to be seen! How does one go from being deathly-scared of public-speaking to becoming someone who welcomes the opportunity to be on stage? In my case, the answer is very simple. All credit for my transformation goes to the Introduction Leaders Program (ILP) - a highly-specialized six-month course that I went through in 2008. Wow! Really? A six-month course did it for me? Yup, it did. That statement comes with some qualifiers. While it is the 6-month ILP course that is most responsible for the transformation, the gains during the course itself were a cumulative effect of the work done over a 2+ year period between 2007 to 2009. During those years, I was very actively involved with the Landmark Education community in New York City. I had completed the pre-requisite courses over a period of 1.5 years before participating in the ILP course. Landmark Education Programs and Seminars happen over weekends and on weekday evenings. The ILP course is structured as a series of classroom and assisting sessions (during weekday evenings & weekends) over the six months period. During the 2+ year period mentioned above, I used to spend 2-3 evenings every week and a full weekend once every month or so at the Landmark Education office in New York City, either attending or assisting in one of the seminars/programs. It was a very empowering and nurturing environment to be part of. My quality of life shot up a few notches because I had immersed myself in that space for those 2+ years. Even though I haven't been in a Landmark Seminar / Program since end of 2009, the lessons learned from my association with Landmark Education have been serving me extremely well ever since. I consider the education I got during those years to be the BEST EDUCATION OF MY LIFE! How did the ILP course cause such transformation in me? The main objective of the course was to train participants in conducting a 3-hour introduction to Landmark Forum - the flagship program of Landmark Education. I did the Landmark Forum course in June 2007 and had the experience of walking out of a long dark tunnel and into bright light for the first time in one's life! Given the amazing experience I had in this first brush with Landmark Education, I was excited and very happy to share about it with everyone I could talk with. The ILP course trained me in giving a structured and effective introduction to the Landmark Forum. A few months after finishing the course, I realized that the lessons I learned during the course not only made me good at giving an introduction to the Landmark Forum, but had made me a better public speaker as well! Some lessons I learned from the ILP course. Below are six lessons that have been ingrained very deeply in my psyche because of my participation in the ILP course. "Deeply ingrained" is the right way to put it as these have become a natural part of me and I don't even make a conscious effort to think about them. As Seth Godin puts it very eloquently, Every presentation worth doing has only one purpose: To make a change happen. While leading an introduction to Landmark Forum, my goal was very clear: To make the audience members see a glimpse of the power of the Landmark Forum course, and inspire them to take a step to do the course. It was not making a presentation for presentation's sake. 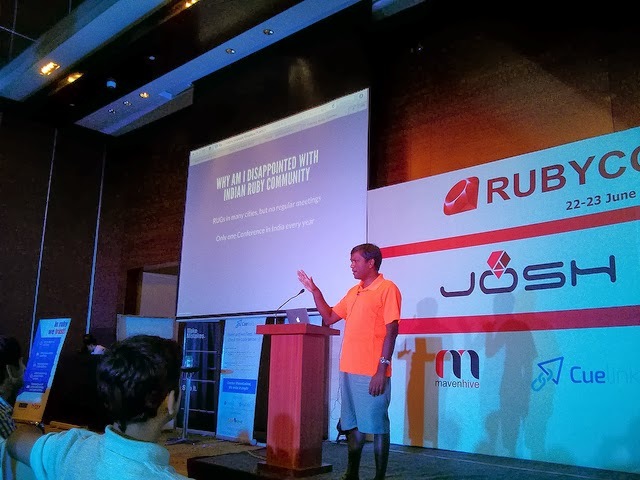 When I spoke at RubyConf India earlier this year, my goal was to inspire the audience members to devote time for community building activities. The talk was a success as many people have started and continued to do so after being inspired by my talk! Follows from the first lesson as it is the audience members who are to do something based on what they see/hear in the presentation. Looking back at the time I was in ILP course, I realize now that it was this point that I and many of the others had difficulty grasping. Caught up in our own fears and neuroses, we rarely ever focused on the audience member. I think the biggest lesson for me in this context was to learn the ability to get myself out of the way and connect with the audience while presenting in front of them. Lesson #3: Practice makes perfect. During the 6 months of the ILP course, I must have practiced - the full, and parts of - the introduction at least a hundred times - with an audience of 1 to an audience of 50+; with my peers in the course, with the coaches who were volunteering to help us out, with the class leader who was training us, and - toward the later stages of the course - with small groups of complete strangers. I got better and better with more practice. Lesson #4: Constant feedback - and follow up corrective action - fuels growth. A corollary to the previous lesson. Over the six months of the course, I got to perfect myself by taking action on the constant stream of feedback coming at me from my peers and coaches & the class leader at each of the practice sessions. The more I practiced, the more my flaws and inauthenticities were highlighted through others' reflection of what they got from my presentation, and the better I got by getting rid of those flaws/inauthenticities. End result was I could be myself & very comfortable without my mind going into all sorts of crazy corners while presenting. The Introduction to Landmark Forum had a standard script which dictated the flow through the 3 hour period. However, it was very clear that one does not have to follow the script by rote to be effective in a presentation. In fact, it is quite likely that the presentation would be a failure if one were to do so. The context of "being of service to others" built into the Introduction was far more influential in the effectiveness of the presentation than the actual words used during the presentation. This last one is more of a realization I have come to long after completing the ILP course. Previously, given my dread of public speaking, I lived with a motivation to avoid many situations and consequently living a limited life. These days, I go about life less dictated by fear. Can't emphasize too much how liberating it is to not be bogged down by fears in one's own mind! Public speaking is a learnable skill. There are options out there to enable you to acquire this important life skill. The Introduction Leaders Program - with its very structured approach - did the trick for me. Find one that does it for you. Landmark has a big presence in India as well with offices in Bangalore, Mumbai, & Delhi, and courses held in these and many other cities. Many of my family members did the Landmark Forum course in Bangalore. If you are inspired by my blogpost to do these courses yourself, contact your local Landmark Office!